Wild’s player coach Ollie Barron (#7) and Stuart Brittle (#24) put pressure on GB women’s international netminder Samantha Bolwell in the Blackburn goal during the 14-1 win over the Hawks2 team on Sunday (photo by Geoff White – www.gw-images.com). 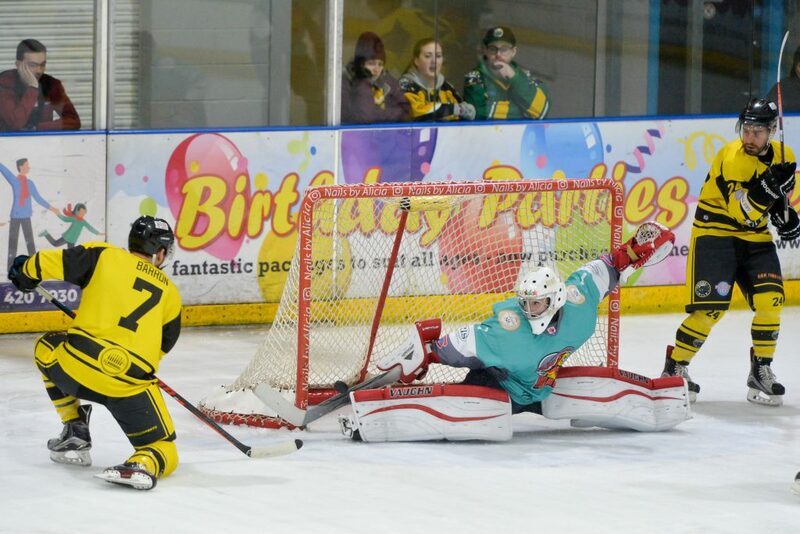 The YKK sponsored Widnes Wild got back to winning ways with a comprehensive 14-1 victory over Laidler Division strugglers Blackburn Hawks 2 at Planet Ice Widnes on Sunday. It was a good way for Widnes to bounce back after the narrow defeat away at title rivals Telford Tigers the night before and, while they put up a valiant battle for the whole 60 minutes, the Hawks development team were never going to stop the Wild notching up their 21st win of the league season. Despite having most of the possession, it took Widnes almost 7 minutes to open the scoring and when Shaun Dippnall’s strike hit the back of the Hawks net, there was a certain sense of relief felt around the rink. A goal from player coach Ollie Barron just over a minute later doubled the advantage and a strike from team captain Simon Offord in the 10th minute effectively put the game beyond the reach of the youthful Blackburn outfit with two and half periods still to play. A goal for Mikey Gilbert in the last minute of the period gave Widnes a 4-0 lead at the first break and, with all credit to the defensive tenacity of the Hawks team, the score was still 4-0 until 15 minutes into the second period when Stuart Brittle scored a fifth for the Wild and then two goals within 30 seconds of each other – from Mike Mawer and Brittle again – made it 7-0 at the second break. Tom McDonald put in an impressive display in the Widnes net, keeping out everything that came at him and, with 10 minutes left to play, he was replaced in goal by local folk-hero Barry Sprakes. The Wild out-shot the Hawks by a huge margin in the third period – by an incredible 32 to 4 – and scored a massive 7 goals in the process. Michal Novak bagged two and Barron and Hajek one apiece before the Blackburn team finally scored their opening (and only…) goal of the game with Bartholew Ainsworth finding the back of the net on a powerplay in the 55th minute. Further goals for the Wild – from Chris Gee, Bez Hughes and Mike Mawer – rounded off the scoring for the game and the ensuing 14-1 result meant that the weekend finished on a positive note. The weekend’s results overall leave the Wild still leading the Laidler Division table with a 10 point advantage over second place Telford Tigers 2 who have a game in hand. Hull Jets are just behind Telford in third with two games in hand over the Wild but Widnes still have home games to come against both of those teams. The YKK sponsored Widnes Wild are next in action this Sunday 3rd February when they entertain local rivals Deeside Dragons in what should be a feisty derby clash at Planet Ice Widnes. This game is the rearranged date for the fixture that was originally due to be played on 28th November but which had to be rescheduled. Face off is at 5.30pm and doors open at 4.45.